Since the start of the 2017-2018 season, we’ve seen nearly five of the Bruins’ top players fall to injury, leaving the third and fourth liners to pick up the pieces. The result has been a new, gritty style of play, and a new lineup featuring young talent from Providence. After missing six games, David Krejci was placed on injured reserve Monday, prolonging his return for another week – at least. 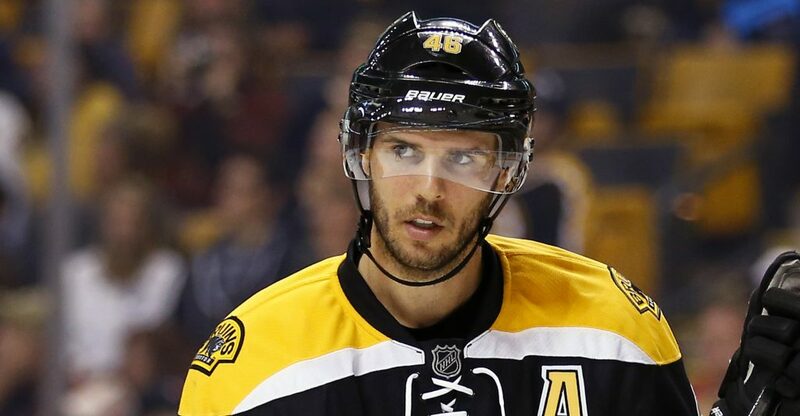 Krejci’s been watching the ice this season due to a significant upper body injury playing against Vancouver on Oct, 19. Needless to say, the team is missing him, and faceoff wins have not been nearly as common as the top center left the ice. Goaltender Zayne McIntyre acquired some spotlight after Boston pulled him from Providence on emergency to cover for the temporary loss of Krejci and goaltender Anton Khudobin. David Backes will be missing up to eight weeks due to a surgery late Thursday night on his colon. Boston knew they might be losing the valuable winger for a while after a diverticulitis diagnosis in September took him out for the beginning of the season. Bruins’ trainers suggested waiting to see how he responded to medication and diet changes, though Backes was subject to recurrence. After returning on Oct 19 and playing just five games, his condition worsened leaving surgery as the only option. “The operation went smoothly and he has started his recovery.” The Bruins announced to nhl.com Thursday night. In the meantime, Forward Jordan Szwarz was pulled as a fill-in from Providence to join Danton Heinen and Anders Bjork on the second line. The young player has already racked up two points and a plus-two average on the ice, this season. Marchand’s recent upper-body injury came as a surprise to fans, as it was announced Monday that he would not play against Minnesota. Boston prevailed without the presence of the feisty left-winger on their first line. After recovery from a previous injury and a productive practice on Friday, Marchand seemed good to go, making the hit to the Bruins’ first line all the more painful. Taking multiple hits to the head during Saturday’s loss versus Washington, Marchand took to the bench. As far as the upcoming week goes, Bruins’ head coach, Bruce Cassidy told NHL.com “Marchand won’t be traveling with us, so that’s the best I have. He’ll be out Wednesday.” Marchand leads Boston in total goals (eight) and points (14) this season. Both Center Noel Acciari and Goaltender Anton Khudobin are traveling with the team on this week’s upcoming road trip. Khudobin, suffering from a lower-body injury, may play Wednesday if his health continues to improve. Acciari, out with a broken finger, will not be playing Wednesday, though some ice time on Friday could be a possibility. The current state of the Bruins’ roster made their recent wins over Las Vegas and Minnesota in the last week, all the more important. With so many of the Bruins’ top players out on injured reserve and recovering from minor injuries, Head Coach Bruce Cassidy is enforcing a new, more gritty approach to winning. The loss of Marchand to an upper-body injury after Saturday’s loss to Washington woke Cassidy up, forcing him to appoint younger players from Providence to play on top lines. This isn’t ideal for the struggling team, that saw injury since the beginning of the season with top players such as Adam McQuaid, Ryan Spooner, Acciari, and now Backes and Krejci out on injured reserve. Players such as Sean Kuraly and Matt Beleskey have come forward to pull the team together. Third and fourth line players have become essential to gathering wins within these taxing next few weeks. The Bruins pulled up Rob O’Gara from Providence, who could be an answer to the current challenges they’re facing. Thursday, the Bruins beat the Golden Knights 2-1 at home, with Rask turning away 28 shots and a third period tally from Kuraly. Friday, The Bruins fell at home to Washington 3-2 as a result of Tom Wilson’s first career two-goal game for Washington. Monday, Boston defeated Minnesota 5-3 with two assists for both Chara and Szwarz, leading to a defeat at home. One comment on "Bruins Notebook: Injuries Adding up; Boston Eases Tension With Roster Changes"
Hardwork beats talent when talend doesn’t work hard!! Great job kid!